Welcome to the Chimacum Grange new website! At 100, the Grange is embracing the next century and invites you to learn her history, rent her for your upcoming function, become a member, attend events, and generally get involved. Young at heart, she is as much a community asset as ever. The National Grange (officially The Order of the Patrons of Husbandry) is a secular, non-partisan, fraternal organization founded in 1867. It is the oldest American agricultural advocacy group with a country-wide scope. Sadly the 14-carat gold pins and secret handshakes of yesterday are gone, but the rural advocacy, neighborhood networking, and fun times continue. Plus here in Chimacum, we have a great hall and an extra-fabulous community. A charming historic building built in 1932, the Chimacum Grange is available to groups and private individuals for rent. Book your next event here! The rental space includes the upstairs performance hall which seats 70 with a full stage, backstage, stage curtain and newly-tuned piano. Downstairs is a conference room with restrooms and a non-certified kitchen. Outside there is a lawn and parking for 40 cars. Our rates and procedures have recently been simplified. A public Grange meeting is held the second Wednesday of every month at 6:30 pm beginning with an optional potluck and mingling, followed by a presentation and discussion of topics of interest. Join our mailing list to get a monthly notification. The Grange and others sponsor a variety of other public events. Click here for a current listing of upcoming dances, classes, meetings, performances brought to you by our community. 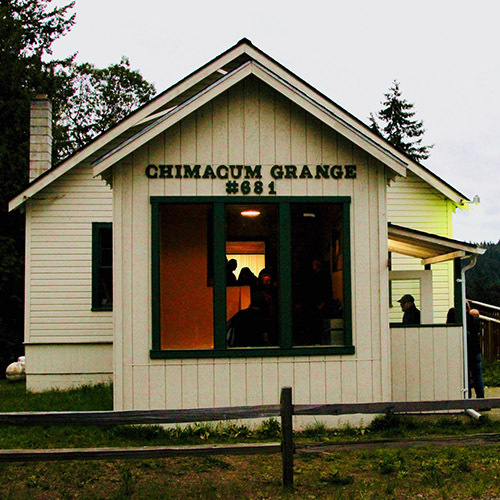 Chimacum's Grange Building is a cherished community asset which several individuals are trying to revitalize and steward into its second century. There are many ways to get involved: Rent the Hall, Attend Events, Become a Member, Volunteer, Donate, or help us plan and celebrate the Grange Centennial this summer.